^ What is Decentralised Energy?. The Decentralised Energy Knowledge Base. ^ Combined Heat and Power – Effective Energy Solutions for a Sustainable Future (PDF). Oak Ridge National Laboratory. 1 December 2008 [9 September 2011]. ^ Carbon footprints of various sources of heat – biomass combustion and CHPDH comes out lowest. Claverton Energy Research Group. ^ Cogeneration recognized to be the most energy efficient method of transforming energy. Viessmann. ^ 7.0 7.1 Latest Developments in the Ene-Farm Scheme. [15 May 2015]. ^ Launch of New 'Ene-Farm' Home Fuel Cell Product More Affordable and Easier to Install - Headquarters News - Panasonic Newsroom Global. [15 May 2015]. ^ 9.0 9.1 Pearce, J. M. Expanding Photovoltaic Penetration with Residential Distributed Generation from Hybrid Solar Photovoltaic + Combined Heat and Power Systems. Energy. 2009, 34: 1947–1954. doi:10.1016/j.energy.2009.08.012. 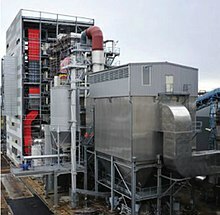 ^ Fuel Cells and CHP 互联网档案馆的存檔，存档日期2012-05-18. ^ Newsroom: Steam. ConEdison. [2007-07-20]. ^ Bevelhymer, Carl. Steam. Gotham Gazette. 2003-11-10 [2007-07-20]. ^ Nosrat, A.H.; Swan, L.G. ; Pearce, J.M. Improved Performance of Hybrid Photovoltaic-Trigeneration Systems Over Photovoltaic-Cogen Systems Including Effects of Battery Storage. Energy: 366–374. doi:10.1016/j.energy.2012.11.005. ^ Nosrat, Amir H.; Swan, Lukas G.; Pearce, Joshua M. Simulations of greenhouse gas emission reductions from low-cost hybrid solar photovoltaic and cogeneration systems for new communities. Sustainable Energy Technologies and Assessments: 34–41. doi:10.1016/j.seta.2014.06.008. ^ 38% HHV Caterpillar Bio-gas Engine Fitted to Sewage Works - Claverton Group. [15 May 2015]. Energy Policy Act of 2005 - sec. 1817 "Study of Cogeneration"